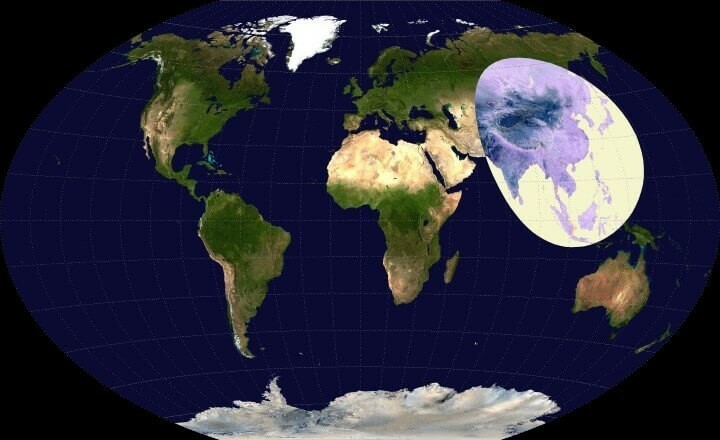 As this circle created by Brilliant Maps shows, more people live inside this circle than outside of it. While the map looks surprising at first glance, it shouldn’t really once you consider it contains all or most of the world’s most populous countries: China, India, Indonesia (fourth), Pakistan (sixth), Bangladesh (seventh) and Japan (tenth). And according to the World Population Prospects 2017, a recently updated UN report, the world population will hit a staggering 9.8 billion by 2050 . China (with currently 1.4 billion inhabitants) and India (with currently 1.3 billion inhabitants) will remain the two most populous countries, and Nigeria will overtake the United States to become the third-most populous country in the worl d.
Demographic growth presents a global challenge: In 13 years (2030) the world population is projected to grow more than one billion people, reaching 8.6 billion people. It will reach 9.8 billion in 2050, and 11.2 billion in 2100. In other words, 83 million people is being added to the world's population every year. Concern about the size of the world's population arose in the last century. In 1914, the world had about 1.6 billion people and in 1991, Kofi Annan symbolically received the child who made the 6 billion in Sarajevo. From 1950 to the mid-1980s, world population doubled from 2.5 to five billion, and many predicted mass starvation, because the power of population was so superior to the power in the earth to produce subsistence for man. But they underestimated the human ability to innovate and solve problems. As Johan Norberg explains in his book Progress: Ten Reasons to Look Forward to the Future artificial fertiliser became the most powerful weapons against the scourge of hunger. The expansion of population would not have been possible without the synthesis of ammonia. "Without the Haber-Bosch Process about two-fifths of the world population would not exist at all", writes Norberg. Nowadays, the problem is not only overpopulation, but also the anormal disparity in its distribution. 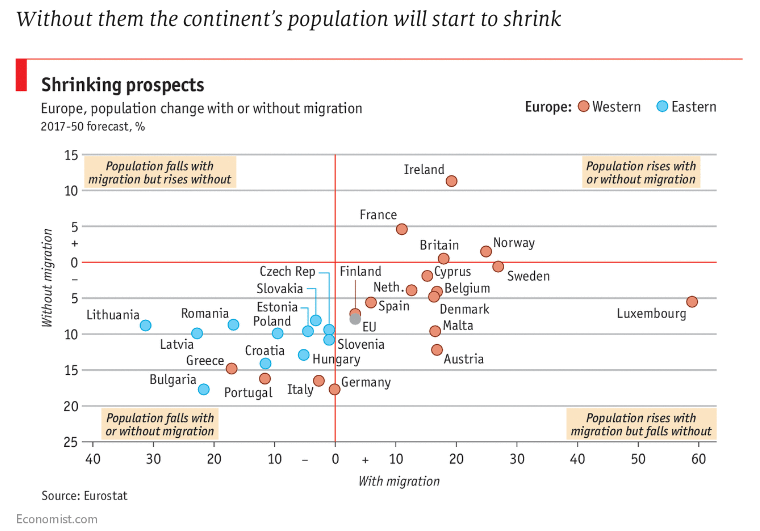 On the one hand, great challenges of overpopulation are presented to poor and emerging countries while, on the other hand, the European Union , Japan and the United States will need to revise migration policies and implement new changes in their economic models if they want to guarantee pensions and social security contributions in the coming years. 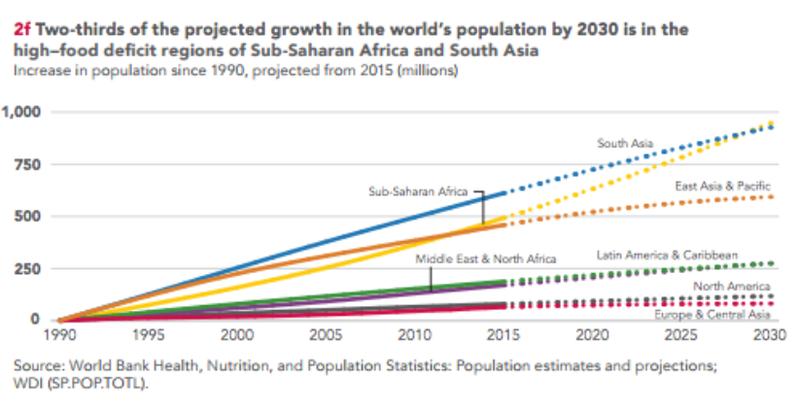 Populations of both Sub-Saharan Africa and South Asia are increasing faster than elsewhere, presenting a challenge for the international community and the Sustainable Development Agenda . The combined population of the least developed countries, which amounts to one billion in 2017 could reach 1.9 billion persons in 2050. High fertility rates, high infant mortality rates and the cultural value of large families have all been cited as factors driving this population boom, and these countries must be prepared as food demand is projected to rise by at least 20 percent globally, with the largest increases in Sub-Saharan Africa (55 percent) and South Asia (25 percent). It was not just an increase in food what saved us from famines, but also lower fertility. "As people became richer and better educated, they had fewer children, not more, as had been predicted", explains Norberg. 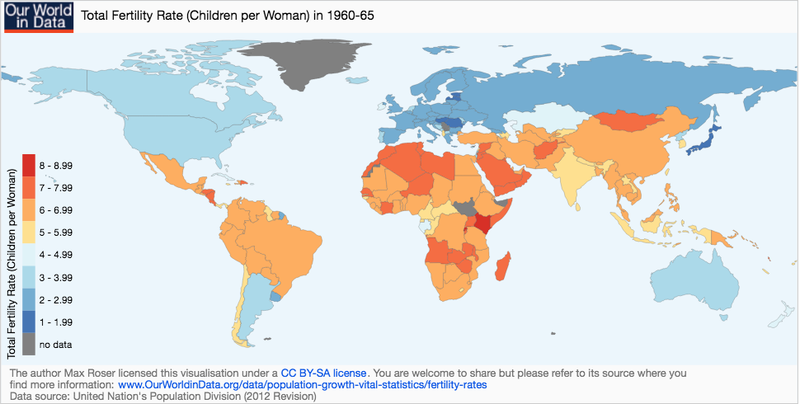 As this map shows, if we observe the reduction from 1960 to 2010, we see how fertility is one of the most fundamental social changes that happened in human history. 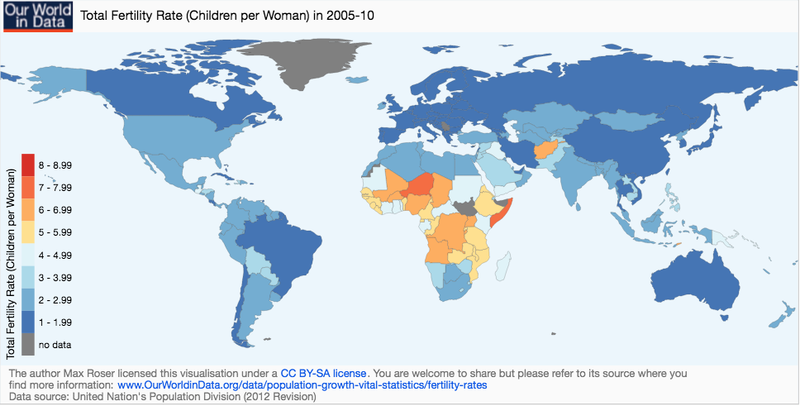 The group of 47 least developed countries (LDCs) presents a high level of fertility (4.3 births per woman in 2010-2015) and the population of these countries has been growing rapidly, at around 2.4% per year, but now this rate of fertility is expected to slow down in the coming years/decades. At the same time, improving agricultural technologies and productivity will be central to addressing poverty and food insecurity. In China a great improvement out of poverty has been achieved; even with a population of 1.4 billion inhabitants the country managed to create a middle class. With the progressive integration of China, India and other large developing countries into the world economy, hundreds of millions will compete in the global market to reach higher living standards. Global structures of production, trade, employment and wages will change with the relocation of people, enterprises, capital flows and financial globalisation. The consequences of global population changes will affect billions of people, and therefore, we will need to revise migration policies and implement new changes in our economic models. It's ok to raise concern about this challenge, but we never shouldn't underestimate our ability to innovate, solve problems and create ideas. The world grows and changes, and more brains thinking solutions and policies will be necessary.